US president Donald Trump’s administration is “likely to have devastating consequences” for LGBT+ healthcare in the country, according to a damning new report by non-governmental organisation Human Rights Watch. 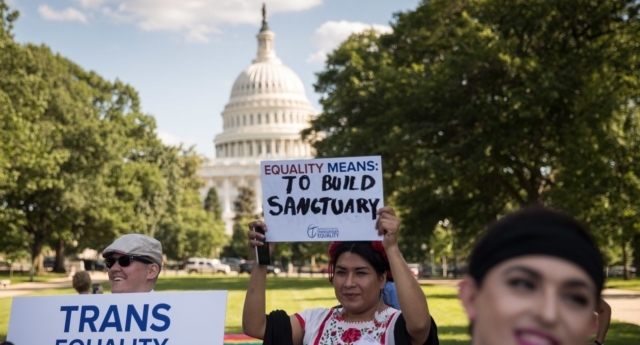 The latest research published on Monday (July 23) concludes that LGBT+ people face “significant barriers” accessing healthcare, which it states is worsening as the Trump government rolls back anti-discrimination protections and introduces religious exemption laws. “Many LGBT people already face difficulties obtaining accessible, inclusive health care,” the 34-page report reads. The report – called “You Don’t Want Second Best’: Anti-LGBT Discrimination in US Health Care” – particularly highlights the plight of transgender people living in America. In May 2017, the US Department of Health and Human Services (HHS) indicated that it would reverse regulations introduced by former president Barack Obama’s administration that prohibit the discrimination of trans people in federally funded healthcare programmes. The department submitted a draft of this proposed rollback of protections in April 2018. The HSS has also suggested a number of other possible rules that could allow providers to refuse key services to LGBT+ people and women on moral or religious grounds. The publication continues: “Many LGBT people have difficulty finding providers who are knowledgeable about their needs, encounter discrimination from insurers or providers, or delay or forego care because of concerns about how they will be treated. In February last year, the Trump government officially revoked guidance – introduced under Obama – protecting transgender students in public schools. And, in May, the Trump administration reversed rules allowing transgender prisoners to use facilities – including bathrooms and cell blocks – that match their gender identity. The Trump administration has also repeatedly attempted to ban transgender people from serving in the military. However, a federal judge blocked this proposed rule in June. The report recommends that laws should be put in place to prevent the discrimination against LGBT+ people in healthcare, and that religious exemption laws need to be repealed. The research was carried out between August 2017 and July 2018, including 81 interviews related to healthcare discrimination.